What's keeping Apple fom announcing deal for Beats? Two weeks and one day ago today, a rumor starting spreading with electrifying news. Apple was going to pay $3.2 billion for Beats Audio and the largest acquisition in Apple history was going to be announced the following week. Since then, we have gone two weeks without hearing a word from Apple about the deal. Obviously, something has happened that has made Apple decide to take another look at buying Beats, before committing to the deal. Where did things go wrong? According to Billboard,one thing that spooked out Apple is the video selfie made by Dr. Dre in which he bragged about being the first hip-hop billionaire following the deal. However, the language used on the video is definitely NSFW. Apple is still a pretty conservative company and probably wasn't terribly pleased with the video. Other reasons given by Billboard for why the deal hasn't been announced yet include the fact that for Apple, as strange as it seems, a $3.2 billion acquisition is a big deal. One person close to Apple's way of thinking says "Remember this is the biggest deal they’ve ever done, and it’s CEO Tim Cook’s first really big deal." Another possibility is that the rumors started spreading too early, and that Apple was not as close to pulling the trigger on the deal as it seemed. At the same time, there still are questions on where Jimmy Iovine and Dr. Dre would fit in at Apple. According to Walter Isaacson, who wrote the definitive biography of Steve Jobs, he believed that the pair was set to oversee the content of the streaming music service formed by the merging of Beats Music and iTunes Radio. Speaking of which, the initial thought was that the deal was being made so that Apple could use Beats Music to improve iTunes Radio. But Beats Music apparently is in need of help itself. With less than 111,000 subscribers, Beats Music had a $200 million valuation prior to the rumor of the deal with Apple, according to Billboard. Either Apple had not completed due diligence yet, or the deal really has to do with headphones. Will this deal ever get done? According to Billboard, we should know some time next week. Where have we heard that before? I think a lot of Apple fans care. For years, Apple has been synonymous with quality, with spending time to get things right. Beats is just garbage and doesn't appear to fit well with Apple's current value system. The forums at the various Mac blog sites have been very active regarding the Beats acquisition and about 90-95% of the posts have been negative. You sometimes have really good points (when you aren't being overly paranoid). I wonder how you get so little upvotes. apples wants the rights to the eq of beats and patents and they are understanding that 3billion no mater how you look at it is just stupid, when its only forth 2 or 3 hundred million, as a company. my beats and my skull candy sound the same they dont need beats. I think it's a really weird deal because HTC only used Beats for branding, and Apple would never do that. I also don't see them manufacturing these crap headphones. It really baffles me that they'd make this deal. Maybe if they announced a deal with sennheiser I would be impressed! Everyone knows beats is garbage this is a terrible deal! I still don't understand the deal. Apple has enough money to create their own line of headphones by hiring the talent and doing their own research in house. It's not like Apple needs the Beats brand name to win over consumers, they have their own brand recognition. Get a refund apple, and send it to Las Vegas, Nevada. I'll put that 3.2 billion to good use. Get off my posts. Nothing to say to u. This is not ur home/gym, this is a public discussion forum. If you don't want certain people to respond then start your own site with your own rules. Why do you people dislike this guy so much?? Well i've actualy been around for 2 years now, & i read 70% of the articles everyday..i just dont comment much!! For example, i know he lives in las vagas, married, has a Note 3 and iPhone, & thats him on the profile picture.. & all this dislike for him didnt start until late last year! !But i still dont understand why?? To me, it just seems alot like jelousy, cause he does like to breg alot!! I don't know why they dislike me so much, but I love it. I can think of several reasons, but no need to name them. Arte 8800 says "Well you have not been here so long", but your account is older than his. Yours is 5/12/12, his is 3/13/14. The reason he said that, is because he's TrollTM, he's been banned 5 times and managed to sneak this acct through somehow. That's why whenever I mention he's actually Troll he gets quiet cuz he knows PA is on the look out for him. He been coming to this site since 2010 as Troll, but uses this acct due to multiple bans. 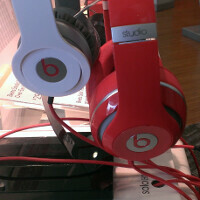 I think Beats just wouldnt fit with Apple. The headphone products are something that Apple already dabbles in, they have a big engineering team that can probably crap out something similar to Beats in a matter of weeks. As far as Beats Music, I guess they may have a lot that could be worthwhile to Apple, but there are better options, would make more sense for them to buy someone like Spotify or Pandora or Rhapsody if that's what they were after.